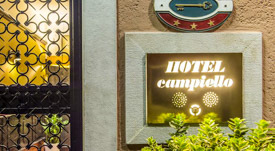 The Hotel Campiello is a popular three-star hotel in a great location: It's just inland from the strip of luxury waterfront hotels along the Riva degli Schiavoni, a short distance from the Piazza San Marco. In addition to traditionally-furnished single, double, and twin rooms, the hotel has modern vacation apartments with kitchenettes in a separate building around the corner. As you leave the Alilaguna Linea Blu airport boat at San Zaccaria, walk toward the left side of the Hotel Savoia & Jolanda (the rose-colored building straight ahead of you). Walk down the Calle del Vin, where you'll find the Hotel Campiello a few meters in from the waterfront.